I remember a big book of art prints my parents owned. We three children were fascinated by those images and the commentary about them--"The Laughing Cavalier" by Franz Hals, "Birth of Venus" by Botticelli, and John Singer Sargent's "Carnation, Lily, Lily, Rose." 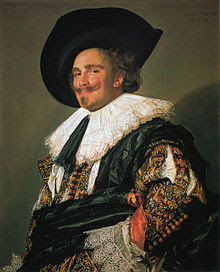 First, that laughing cavalier, bursting right off the page with his joy, his ornate attire, and that look of devilment in his 17th Century eye. I didn't know what a cavalier was, but I knew a happy man when I saw one. "Birth of Venus" featured a naked lady, and my sister and I didn't know why the little boys in the neighborhood all wanted to ogle that one; but the Sargent could have been the two of us, working with lanterns in an overflow of flowers. The Metropolitan Museum of Art advertised a Franz Hals show which will run for a few more weeks, and I didn't want to miss it. I had seen some of his work at the art museum in Amsterdam, and regretted that I didn't get to Haarlem to the Hals studio and museum when I was in Holland. I made a note to myself to get to the Met before the show closed. Last Wednesday I decided, "Now or never," and got myself together enough to find my way to the Met from the PATH train in Hoboken. My friend from Hoboken wrote me this on Facebook when I posted that I was on my way: "Port Authority. Go downstairs to #7 Flushing, 2 stops to grand central, upstairs to uptown Lex. Ave. Get off at 86th." Too bad I didn't see this until after I got home--I had taken the train instead, transferred at 34th to the B, and ended up at the wrong museum. I got a taxi across the park and went into the Met. I didn't know the "suggested" entrance fee is $17 for seniors, but for a chance to see some Franz Halses, I sprang for the full amount. The Met is always awe-inspiring, with its white noise of hushed echoes of people talking and its elegant, old-world architecture. The Franz Hals were just right, a small collection, really, some on loan but some owned by the museum. It's easy to get overloaded with imagery at any art museum, and tempted as I was to try to get my money's worth by walking through other exhibits, I limited myself to the few rooms with the work of Hals. He painted peasants and nobles, whores and potentates. He had a stable of young painters learning from him, copying him (literally) and generally helping cement his place in the firmament of great artists for all time. Van Gogh is said to have been stunned by the excellence of his work. The legends accompanying this exhibition all spoke of his brush work, his slashes, and I was glad to have technical elements pointed out to me. But the overarching beauty of his work to me will always be the gusto of his subjects and the artist's grasp of that. He painted court and political scenes, barroom scenes, portraits of reprobates and hookers, all with an unmistakable verve and sometimes a photographic accuracy. (I can only guess at that, since I never saw the subjects in photographs, but I'm sure I'm right about it.) It is a joy to contemplate the work and wonder and the genius who created it. Coming home, I still really didn't know my way. I knew I wouldn't find a subway on 5th Avenue as I strode downtown--why I didn't just go over to Lex I can't imagine, but I didn't. I walked ten blocks to the street that crosses the park and thought, Well, it's only a few blocks to the West Side subway from here, which was a mistaken assumption. I walked across Central Park, feeling embraced by the beautiful space so beloved by New Yorkers, paused at the lake and fountain, and trudged on until I reached Central Park West, then Columbus Avenue, and then at last my old IRT train that took me to the Port Authority for a bus back to Hoboken. I'll eventually know how make the trip easily. I have in the past. Somehow I always feel at home in Manhattan no matter how ritzy, how snobbish, how intimidating it gets. 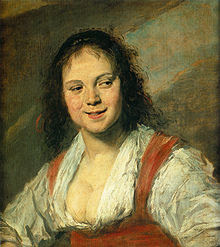 When I am there, I feel close to that young woman I once was, the one who had not yet gotten to Amsterdam and only knew "The Laughing Cavalier" from her parents' art book, the one who lived in a shabby rent controlled apartment and felt as if she owned the universe. She and I are close to New York still, and will always appreciate the fact that there is so much real art so near.